For business school students starting in the Fall who are about to buy a notebook computer for school, there are many alternatives. Notebook manufacturers offer many different product lines and models, numerous form factors that work and multiple operating system options. For example, Dell offers the excellent Latitude line from their business division, the XPS line, the Vostro line and even a series of netbooks. Once you have the notebook you want figured out, there’s one more thing that you should keep in mind. If you decide to go for a Windows based notebook, Microsoft is about to release a major upgrade to Windows, called Windows 7. Vista, as you may know already, was not liked by a majority of those who switched to it. Vista takes up a LOT of resources and requires a more powerful computer to do almost the same things that you could do with an XP based computer before. In many cases upgrading from Vista to XP led to declines in performance infuriating users. Two main things really. First, a system that doesn’t need as much “overhead” as Vista did, i.e. it can run on a lot less resources. Second, better performance. Based on numerous reports from beta testers, Windows 7’s efficiency and performance is drastically better than that of Vista. So why is this relevant to someone buying a notebook for school? Windows 7 will likely not be available until the holiday season of 2009. However, if you buy your notebook with Vista (Home Premium, Business or Ultimate editions only) after June 26th (which is a date set by Microsoft), you will be eligible to upgrade to Windows 7 for free when Windows 7 is realeased. So, if you can hold-off buying until June, this could be a reason to do so. Note: Vista Basic is not eligible. The United Nations brushed aside calls Wednesday to investigate alleged human rights abuses in the recently concluded fighting between government forces and Tamil Tiger (LTTE) rebels in Sri Lanka. Sri Lanka’s allies on the 47-member council, including China, Cuba and Egypt, forced through a resolution with 29 votes to 12 against and six abstentions condemning the rebel group for using civilians as human shields but stressing that the war was a “domestic” matter that didn’t warrant outside interference. A majority on the council backed Sri Lanka in its defeat of the LTTE rebels after years of civil war. This position remained dominant despite pressure from some aid organizations such as Human Rights Watch (HRW) which have previously been accused of taking a pro-rebel stance. Human Rights Watch is now active in the conflict region of Pakistan. The U.N.’s High Commissioner for Human Rights Navi Pillay (of South African Tamil Origin) and several European countries, along with Canada, Chile and Mexico had backed a probe, and had urged Sri Lanka to fully open up refugee camps to international aid agencies. The Geneva-based council chose instead to recommend that Colombo provide aid groups only with “access as may be appropriate” to refugee camps. Sri Lanka’s ambassador in Geneva said European nations had failed with their “punitive and mean-spirited agenda” against his country. “This was a lesson that a handful of countries which depict themselves as the international community do not really constitute the majority,” said Ambassador Dayan Jayatilleka. “The vast mass of humanity are in support of Sri Lanka,” he told The Associated Press. The Sri Lankan government relaxed restrictions on motor vehicles in the country’s largest refugee camp today, the UN also said. Readers of my blog have seen and felt the relief that I felt with the recent defeat of the Liberation Tigers of Tamil Eelam (LTTE) in Sri Lanka and the demise of its leadership. The list below is the main reason that I am so relieved and excited to see this terror group gone from Sri Lankan soil. Piliyandala, pictured in the civilian massacres section below is where I grew up. The information below is based on an article published in the Sunday Times in Sri Lanka on May 24th 2009 which attempts to create a chronology of the attacks that the LTTE (or Tamil Tigers) are responsible for. 2005 August 12: Minister of Foreign Affairs Lakshman Kadirgamar assassinated in Colombo. 1990 May 7: Sam Thambimuttu, EPRLF MP and his wife. 1985 June 26: C.E.Anandarajah, Principal St. John’s College, Jaffna. 1975 July 27: Jaffna Mayor, Alfred Duraiappah. 2009 April 22: Sixteen civilians were killed in Karametiyawa, Inginiyagala. 2008 February 03: At least seven people died and 97 were injured in a suicide bomb attack at the Fort Railway station. 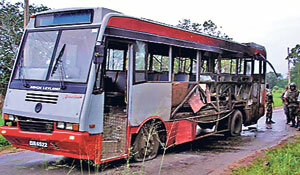 2008 June 06: Twenty one passengers died in a claymore attack on a bus in Katubedda Moratuwa. 2008 January 16: Twenty seven passengers perished in an attack on a bus in Buttala. 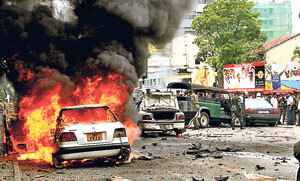 2007 November 28: Seventeen civilians were killed and 37 injured in a parcel bomb explosion at a Nugegoda shop. 2007 January 06: Fifteen civilians were killed and 40 wounded in a parcel bomb explosion inside a bus at Seenigama, near the Kahawa junction, Galle. 2006 July 15: Sixty seven passengers were killed and 90 injured in a claymore mine attack on a bus in Kebithigollewa. 2001 July 24: Attack on the Bandaranaike International Air Port. Twelve people died and 13 aircraft destroyed. 2000 October 5: At least 12 persons were killed and more than 40 wounded when an LTTE suicide bomber blew himself up in an attempt to enter a PA election rally. 2000 March 10: At least 14 civilians and six police personnel were killed and 46 people were injured when a group of five suicide cadres attacked a motorcade on the road to Parliament at Rajagiriya. 2000 January 5: A female suicide bomber exploded herself while she was being body searched by Police near the Prime Minister’s Office in Colombo. Thirteen civilians and three police officers were killed and 27 people wounded in the blast. 1999 December 18: A suicide bomber, detonates a bomb strapped to his body, killing retired Major General Lakshman Algama and 11 persons at a United National Party (UNP) election rally at Ja-Ela in Colombo. 1999 September 18: Fifty civilians were killed in an attack in Gonagala. 1998 March 5: Thirty-six civilians and two police officers were killed and 270 civilians wounded when a mini-bus, filled with explosives, was blown up by a suicide bomber near the Maradana Police Station in Colombo. 1998 February 23: At least 51 troops and 28 civilians were killed in a suicide attack on the Point Pedro coast when eight Tiger boats laden with explosives crashed into two navy ships. 1998 January 25: A suicide bomber blasted a lorry-laden with explosives at the Dalada Maligawa. Sixteen persons were killed while extensive damage was caused to the Maligawa, a cultural heritage site recognised by the UNESCO. 1997 October 15: Suicide bombers detonated a truck packed with explosives in the parking lot at Galadari Hotel close to the World Trade Center in Colombo, killing 18 people and injuring at least 110 others. 1996 July 24: Bomb explosion on Colombo-Alutgama train at Dehiwala killed 60 civilians. 1996 April 18: The naval wing of the LTTE, Sea Tigers, launched a suicide raid on the port of Colombo. Nine LTTE cadres were killed when the troops blew up their boats. 1996 January 31: A suicide bomber detonated a truck loaded with more than 100 kilograms of explosives in front of the Central Bank in Colombo killing 91 people and wounding at least 1,400 others. 1995 November 24: Sixteen civilians were killed and over 50 injured when two women suicide cadres targeted the Army headquarters. 1995 November 11: Seven persons including 15 children were killed when a female suicide bomber exploded herself near the Kompannaveediya Railway Station in Colombo. 1995 October 26: Twenty six villagers were killed in Kebithigollewa. 1995 October 21: Sixty six villagers were killed in attacks in Ampara, Polonnaruwa and Anuradhapura. 1995 August 7: A male suicide bomber set off a cartload of explosives at Independence Square in Colombo, killing 22 people and injuring more than 40 others. 1995 May 25: Forty two civilians were massacred in Kallarawa. 1992 October 15: Massacre of 146 Muslim civilians in Palliyagodella. 1992 April 29: Some 130 Muslim civilians were massacred in the Alanchipothana village in the east. 1990 August 3: An LTTE gang killed 103 civilians in Kathankudy. 1987 July 02: The massacre of 32 Buddhist monks at Aranthalawa. 1986 May 30: An explosion at Ceylon Cold Stores in Kompannaveediya killed eight civilians and wounded 22. 1985 May 14: The LTTE carried out an attack on the Jaya Shri Maha Bodhiya in Anuradhapura, killing 120 civilians. The attackers while they were fleeing also killed 18 civilians in Wilpattu. 1976 July 02: A fuel station manager, S. Nadaraja, was shot dead as he was believed to be an army informant. 2003 March 20: Attack and capture of Chinese “Shu- Yun” trawler- 20 of the ship-crew died. 1991 May 21: Former Indian Prime Minister Rajiv Gandhi and 17 Indians were killed in South India. 1987 -1990: More than 1,000 Indian Peace Keeping soldiers died in northern and eastern provinces of Sri Lanka. 1984: Forty passengers were killed in bomb explosion at the Chennai airport. 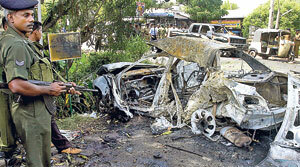 2008 April 06: Minister Jeyaraj Fernandopulle and 12 others were killed in an LTTE suicide bomb attack in Weliweriya. 2000 June 7: A suicide bomber killed Minister C. V. Gooneratne and 24 civilians whilst he was in a procession organised to mark ‘war heroes’ day at Golumadama Junction in Ratmalana. 1995 May 26: The chief incumbent of the Dimbualagala temple Ven Kithalagama Shri Seelalankara thera was killed. 1994 October 24: Opposition leader and United National Party presidential candidate Gamini Dissanayake and 58 persons, including several senior politicians, were killed by a female suicide bomber at Thotalanga in Colombo. 1993 May 1: President Ranasinghe Premadasa and 23 others were killed by a suicide bomber in Colombo. 1991 May21: A female suicide bomber killed India’s former Prime Minister Rajiv Gandhi while he visited the southern Tamil Nadu state for an election rally at Sriperumputhur. 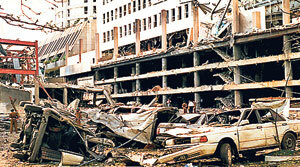 1991 March 2: Deputy Defence Minister Ranjan Wijeratne and 18 people were killed in a blast at Havelock Road in Colombo. 2009 March 10: Minister Mahinda Wijesekara was seriously injured in a suicide bomb attack at the National Meelad Festival in Akuressa. Ten civilians were killed and 60 others wounded in the blast. 2008 October 09: Minister Maithripala Sirisena survived an LTTE suicide attack at Katuwawala in Piliyandala, but five civilians died. 2007 January 28: A female LTTE suicide bomber targeting Eelam People’s Democratic Party (EPDP) leader and Social Services Minister Douglas Devananda blew herself up. The minister escaped but the blast killed his Public Relations Officer. 2006 December 01: Defence Secretary Gotabhaya Rajapaksa escaped an LTTE suicide attack in which six people, including his bodyguards, were killed. 2006 August 14: In a suicide blast targeting the then Pakistani High Commissioner Bashir Wali Mohammad seven people died. 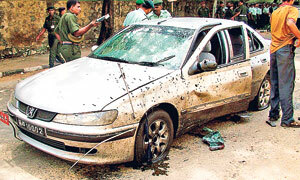 2006 April 25: Army Commander Sarath Fonseka was wounded in a suicide blast inside the Army headquarters. The attack was carried out by an LTTE female cadre who posed off as a pregnant woman. Nine people, including civilians, were killed. 2001 October 29: Prime Minister Ratnasiri Wickremanayake escaped an assassination attempt when police intercepted a would-be suicide bomber who detonated explosives strapped to his body, killing himself and five others. 2004 July 07: In Colombo, five policemen were killed when a suspected LTTE woman suicide bomber blew herself up inside the Kollupitiya police station after she was arrested at Minister Douglas Devananda’s office. 2000 September 15: Seven people were killed and 28 others sustained injuries when a suicide bomber, on being detected, blew himself up. Health Minister Nimal Siripala de Silva had a narrow escape as he had passed through the site barely seven minutes before the blast. December 18, 1999: President Chandrika Kumaratunga was wounded and 21 were killed and more than 100 people injured at a presidential election campaign rally in Town Hall, Colombo. 1997 December 28: Three suicide bombers died when their truck exploded half a mile from the Magalle naval base in the Galle District where Navy Commander Cecil Tissera was staying. Ten shops and two houses were damaged. 1996 July 4: At least 20 people, including Jaffna military commander Brig. Ananda Hamangoda, were killed and 60 injured when a female suicide bomber blew herself up. Minister Nimal Siripala de Silva escaped with minor injuries. Microsoft has announced a possible competitor to the iPod touch, an “HD” version of their Zune MP3 player. It’s a pretty basic 3.3 inch touch screen media player, from what has been shown so far. If you are someone looking at the iPod Touch and wondering why you would buy a Zune instead, there’s really not a lot going for it right now. Possible differentiators: HD Radio, HD Video Out and an OLED touchscreen. The OLED (Organic LED) screen should provide better battery life than for example the last generation iPod touch. But most of these features (except for maybe the HD Video Out) will likely be included on the new generation iPod Touch, to be released this summer. There may be some tie-ins with HD Movies and XBOX Live but for most consumers this is probably a pass. Especially considering that the screen on the Zune HD is lower res (480×272) than the last gen iPod touch! And who listens to radio on their MP3 players anyway? Microsoft has promised that at E3 (Next week) we will see some unique tie-ins with XBox Live. Another thing that remains to be seen is what type of interface and browser Microsoft uses here. The reason that the Touch did so well is the Apple interface and Safari browser. Microsoft will have to do a LOT better than they have in the past to get even close there. Prof. Garth Saloner, extremely popular with current students and alums alike has been named the new dean of the Stanford GSB. Prof. Saloner will take up his office on September 1st, 2009. He was the recipient of the distinguished teacher award in 2008 and also directed the school’s Center for Entreprenuerial Studies. He has co-taught Formation of New Ventures and Managing Growing Enterprises. I am extremely pleased to announce that the GSB Dean’s search has come to a successful conclusion. John Hennessy and I have asked Professor Garth Saloner, the Jeffrey S. Skoll Professor of Electronic Commerce, Strategic Management and Economics, to be the next dean and he has accepted. As I note in the press release below, I believe that Garth will continue the research focus for which the school is renowned, in addition to maintaining its outstanding educational programs. I would like to thank the search committee, co-chaired by John Roberts, for the exhaustive and lengthy process that yielded this recommendation. Garth will take office on September 1, 2009. I hope you will join me in thanking him for taking on the responsibility of leading the GSB into the next decade. Ellen DeGeneres Commencement Speech at Tulane University, May 16th 2009. “..I didn’t go to college at all. Any college. “..By the time I was your age, I really thought I knew who I was, but I had really no idea.. The Liberation Tigers of Tamil Eelam (LTTE) have confirmed their leader, Velupillai Prabhakaran, has been killed. “We announce today, with inexpressible sadness and heavy hearts that our incomparable leader and supreme commander … attained martyrdom fighting the military oppression,” Selvarasa Pathmanathan, the LTTE’s head of international relations, said in a statement on Sunday. The Tigers said Prabhakaran had been killed on Tuesday during fighting between the LTTE and the Sri Lankan military and declared a week of mourning. Previously, on the 19th of May, the same individual (Selvarasa Pathmanathan) had stated “Our beloved leader is alive and safe. He will continue to lead the quest for dignity and freedom for the Tamil people,” in a statement carried on the pro-terror Tamilnet website. Selvarasa Pathmanathan (also known as KP) is wanted by interpol for terrorism and weapons smuggling and is the only surviving member of the LTTE “higher level” operatives.